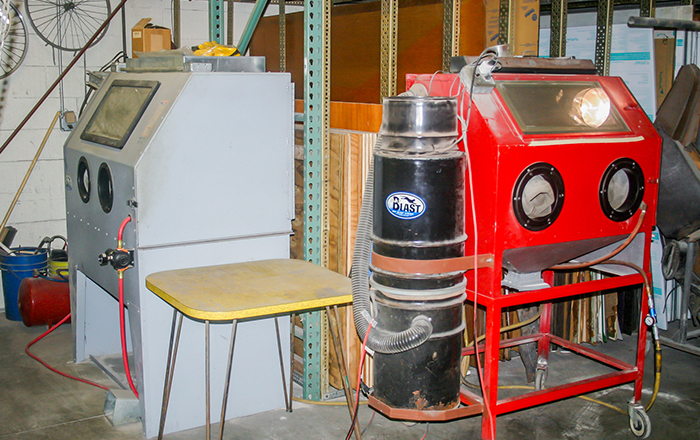 Sandblasting · Min Plastics & Supply, Inc. The matte finish will scatter the light and provide an evenly lit surface. Compared to a glossy surface light passes straight on. We can create an even matte finish by preparing the surface with sandblast media. This works extremely well when adding LEDs or adding lights to a plastic feature. Designs can be masked off with tape to protect the design and create a matte surrounding. Back masking is when we apply tape over areas we want to protect from turning into a matte finish. We can also back mask the glossy surface only allowing the media to hit the unprotected design leaving the surround glossy. Sandblasting is also a great alternative to laser engraving. When the part is larger than our laser’s capacity or when internal surfaces have designs or the design wraps around an edge.